CHITTENANGO, N.Y. — It would make sense that the hometown of L. Frank Baum, the creator of the Wizard of Oz, would be in a county that voted for President Donald Trump. Trump easily carried this part of upstate New York, which contains places just as rural as Dorothy Gale’s Kansas. But despite the nearby Yellow Brick Road Casino in a converted strip mall, there’s no Emerald City. So Republican members of Congress who represent these parts have a particular challenge and have to fight for federal dollars for their districts. That might be getting more difficult with the recent release of Trump’s fiscal 2018 budget, which proposes significant cuts to programs that provide economically stagnant places like this a helping hand. Take Rep. Claudia Tenney, a Republican representing a central New York district that has never fully rebounded from factory shutdowns and the closure of the old Griffiss Air Force Base in Rome. A press release her office sent out just after Trump unveiled his proposed budget could be viewed as a blueprint for other Republicans seeking to showcase disagreements with the White House Office of Management and Budget. It listed a series of proposals in the budget that Tenney and lawmakers with similar constituencies might find objectionable and take aim at, such as elimination of the Low Income Home Energy Assistance Program and the proposal to reduce funding for the Legal Services Corporation to the tune of $351 million. For Democratic incumbents in the Senate who represent similar populations, the budget proposal might be an opportunity to criticize GOP challengers whom Democratic groups say they will try to tie to Trump. The large reductions proposed to entitlements are tied to the ongoing debate over rolling back the 2010 health care law. Sen. Bob Casey is one of the Democratic incumbents sure to be targeted by Republicans in 2018, given that Trump carried his home state of Pennsylvania. “This program has never been threatened like this ever,” Casey says of the proposed cuts to Medicaid through both the Trump administration’s budget request and the House-passed GOP health care reconciliation plan. Casey did not want to speak specifically to the potential political consequences for House Republicans from his home state who might support Trump’s proposed $800 billion in cuts to Medicaid. But he did say that his GOP colleagues should discuss the policy with constituents and officials from rural hospitals. Casey points out that in many communities, the local hospital systems and nursing homes are major employers and economic engines. “Communities that voted overwhelmingly for him are the hardest hit by his cuts to rural funds for health care and more — and they’ll certainly remember that at the ballot box. Slogans may sell bumper stickers, but consumers and families vote with their pocketbooks, and the boomerang effect of these cuts back on the very voters that elected Trump could quickly become quite real,” Mulhauser says. In West Virginia, Republican Rep. Evan Jenkins has already announced that he is running for Senate against Democratic Sen. Joe Manchin III. But Trump’s lopsided victory over Democrat Hillary Clinton in the Mountain State last fall does not have Jenkins on board with the president’s budget. 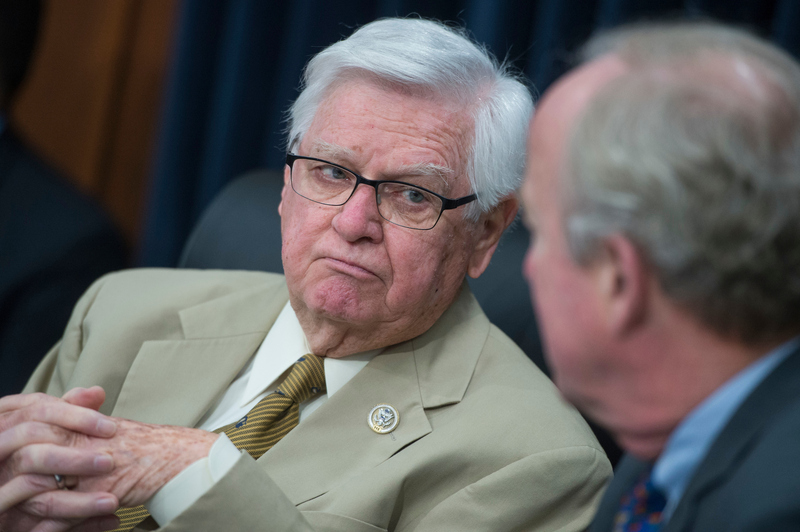 Rep. Harold Rogers, the past chairman of the House Appropriations Committee, represents a rural constituency in Eastern Kentucky coal country that depends on a variety of federal programs and services, including the Appalachian Regional Commission, which is one of several economic development programs targeted for elimination by Trump’s budgeteers. That’s why appropriations bills — with or without a final deal on topline spending — are sure to look much different from what the White House has suggested. Senate Majority Leader Mitch McConnell, also a Kentucky Republican, was quick to tell constituents back home that the Appalachian Regional Commission would not be facing an ax. Democratic political strategists have wasted no time tying Republicans — including potentially vulnerable senators far from coal country such as Nevada’s Dean Heller and Arizona’s Jeff Flake — to the spending priorities outlined by the White House. Among the programs referenced by Bergstein is Essential Air Service, which subsidizes commercial flights to smaller, rural airports. Some of those would lose air service entirely without the federal funding. That’s another of the elimination targets in the Trump budget where there has been little or no support on Capitol Hill. Strategists on both sides of the aisle say, however, it could be difficult to gain traction against Republicans for proposed cutbacks that never take effect. One GOP strategist said efforts by Republicans to ding Democrats over their failure to adopt a budget resolution during chunks of the presidency of Barack Obama had limited impact. The government kept running, after all, and budget arguments in the abstract can easily fail to attract attention. But strategists say Democrats and Republicans alike may want to stay aware that they could face electoral blowback if programs critical to their constituents ultimately do get cut, and they are unable to save them from the budget ax. With Trump in office and GOP majorities in both chambers, Republicans could argue that Democratic incumbents lack the clout to influence spending policy. Democrats could make the broader argument, that Republican control makes the cuts inevitable, and the party in power bears ultimate responsibility. Meanwhile, both chambers are proceeding with an appropriations process without the benefit of passing a budget resolution. For some, it’s likely the safest route for now. Bridget Bowman contributed to this report. Get breaking news alerts and more from Roll Call on your iPhone or your Android.